You discuss making the regular payment that goes toward interest and principle and then making another payment. (before the next payment is due.) If I read correctly, the additional “interim” payment all goes toward the principle. Is this correct, and is it the same for paying off credit card debt? I usually make one large payment for the month right after my credit card statement closes for the month. For example: The min payment is $100 and I make a $1000 payment right after the statement closes (so as not to accrue more interest) and that is it. Should I make the minimum payment when my statement closes and then pay the rest during the month – or does it matter? Love your posts! Thanks. This isn’t a situation where you can go to the amortization calculator site and plug in your principal and APR because the term of the loan isn’t defined. And your principal will grow as you continue to make purchases with the card. I think you should call your bank and have a talk with them. They should be able to offer you a lot of guidance on this one since it’s a pretty common thing. It’s always a nice reminder to see how much one early payment can make. It definitely keeps me motivated to not only apply extra each month to my loans, but also to put any additional freelance income I make towards them as well — it can be so tempting to go into “i deserve to spend this on myself” mode. But really, extra payments towards a loan are a lot more meaningful to my overall happiness in the end: that much closer to financial freedom! Absolutely. I think everybody should print out their prison sentence at with their monthly payment schedule and put it on their fridge or next to their computer or whatever so they can see how much interest they’re paying each month. That would motivate the hell out of me. As a side note on making extra payments to the principle of your debt, be sure to check with your lender first before making a payment. In talking to Wells Fargo (which owns my private portion of debt) I can only make extra payments to the principle on the day my regular payment is made. Otherwise, the extra payment will go toward principle and interest. 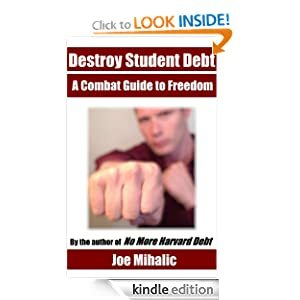 What about student loans which typically have a much lower interest rate and needs-based deferment plans? Is there any reason you shouldn’t pay them down quickly? Some people choose to pay just the minimum even when they could pay more. Some people might invest the money elsewhere, hoping for a better return.